Beautiful Petit Smooth Urn - Autumn Leaves Gold style - 18 karat gold leaf paint/ 3-fire process - 3.75 inches high x 4.0 inches wide (9.5cm x 10.0 cm). Holds 1 cup of volume. Beautiful Petit Smooth Urn - Blue e Oro style - 18 karat gold leaf paint/ 3-fire process - 3.75 inches high x 4.0 inches wide (9.5cm x 10.0 cm). Holds 1 cup of volume. 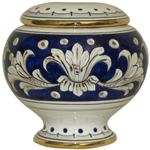 Beautiful Small Smooth Urn - Blue e Oro style - 18 karat gold leaf paint/ 3-fire process - 4.75 inches high x 5.0 inches wide (12.0 cm x 12.5 cm). Holds 2 cups of volume.